Distributor: Currently licensed by Viz Entertainment, available on Hulu. Notes: Based on the manga by Hotta Yumi and Obata Ken. Shindou Hikaru, an elementary school student with a penchant for trouble, is rummaging around in his grandfather's attic for something to pawn off when he discovers an old goban (a four-legged board for playing igo, an ancient Chinese game of stones). Inspecting the board, he notices bloodstains on the corner, but his friend, Akari, can not see them. Unknown to either of them, the spirit of an ancient go master, Sai, has been trapped inside the goban for years, and upon sensing Hikaru, it comes out and possesses him. At first, Hikaru is annoyed by the ghost and refuses its request that he allow it to play igo through him, but when the spirit's sadness at being unable to play the game it died for makes Hikaru physically ill, he relents and goes to a local go salon to let Sai play. There he meets Touya Akira, a boy his own age whose father is a master go player. After Sai soundly trounces Akira (through Hikaru), a one-sided rivalry forms as Akira, frustrated that a boy his age who can't even hold the stones correctly beat him, tries to discover just who Hikaru really is. Drawn into the sport through the games that Sai plays through him and the people they meet, Hikaru decides that he wants to be the one who plays and begins learning the game for himself. 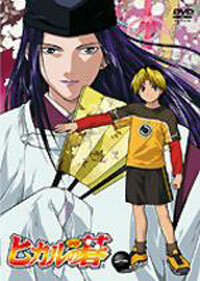 To me, Hikaru no Go is proof that anime can make anything interesting if done well. This title flies in the face of the glut of children's anime shows in recent years based on card games and video games. Igo (more commonly known as just Go) is the oldest board game in the world, and some assert that it was the first. With over two thousand years of history behind it, that claim is not hard to support. It has been vastly popular throughout Asia for centuries, and almost every major East Asian country has a professional league and schools dedicated to its teaching. Yet in recent decades, the popularity of the game has declined with younger people, with the advent of home video game systems and other popular amusements. Hikaru no Go is an attempt to bring a younger generation into contact with a game that for years has been thought of as being played only by old men and bookworms. It achieves this end through a superb set of interesting characters, a well-written story (adapted directly from the manga of the same name), and a way of introducing and teaching the game that is both fun and informative without being overly complex or pandering. The latter half of the series also gives a unique take on the inside (and often cutthroat) world of professional igo. The depictions of the various places where the game is played, how it is sponsored, and the attitudes of the professional players closely mirror the actual professional go world (with more than a healthy dose of melodrama for effect, to be sure). Almost as much fun as watching Hikaru and Sai is watching the other pros have at each other in sometimes nail-bitingly tense games. Most of all, though, the show is viewer friendly. You don't need to know or care a thing about the game of go to walk away with something from this series. Of course, people who enjoy such games of skill will inevitably find more to appreciate than those who do not, but even for more action-oriented fans, Hikaru no Go can be a fine change of pace. The intro and ending songs are well done, and the background music, while sometimes over-the-top during tense matches, is more than adequate. The animation style is a bit slow and motionless, ala Studio Pierrot, but then again, this isn't an action-packed show to begin with, so it does what it should. In all, Hikaru no Go is a better than average series that will appeal to a wide range of anime fans, but will specifically be of interest to those that enjoy plot and substance over action. Highly recommended. Recommended Audience: No violence, no foul language, and generally nothing to be offended by, period, unless for some strange reason you find Igo offensive.